In 1789 Benjamin Franklin wrote in a letter "In this world nothing can be said to be certain, except death and taxes". Our speaker, Daniel Scully from Warwick University, would definitely like to add one more universal constant – the speed of light. In fact, during his talk called "Neutrinos faster than light?" he said that his favourite physical theory was Einstein's Special Theory of Relativity, which states that the speed of light is the same for all observers. Recently this fundamental speed limit to the Universe has come into question when a particle physics experiment produced data that seemed to show neutrinos travelling faster than light. They were arriving at a detector 60 ns earlier than predicted (1 ns = a billionth of a second). This has sent shock waves through the physics community with one physicist, Prof Jim Al-Khalili, stating he will eat his boxer shorts on live television if the result is proven. The experiment called OPERA (Oscillation Project with Emulsion-tRacking Apparatus) was not set up primarily to measure the speed of neutrinos but rather to test the phenomenon known as neutrino oscillation. This is where one type of neutrino changes into another type as it journeys through the cosmos. Basically, there are three types of neutrino: electron, muon and tau in the family of 12 particles that physicists call The Standard Model. They are tiny particles with negligible mass and travel at almost the speed of light. They rarely interact with matter and so stream through our planet as if it was not there. This lack of interaction means that neutrino experiments need to use a very large detector medium so that it becomes more likely an interaction is recorded. Neutrinos are emitted in any nuclear reaction including the centre of our Sun, supernova explosions, nuclear power plants, particle accelerators, or as high energy cosmic rays crash into our atmosphere. One of the reasons that physicists such as Daniel Scully study them is that they hope these particles will help to answer the puzzle of what happened to all the antimatter in the early Universe. 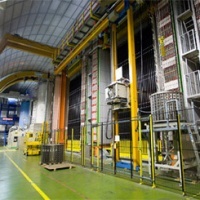 The neutrinos in question began their journey as muon neutrinos in a particle accelerator in CERN on the Franco-Swiss border and were detected in a laboratory over 700 km away in Gran Sasso, Italy. To measure time and distance in the experimental set up between the countries the scientists used common-view GPS signals in conjunction with incredibly precise atomic clocks at both ends of the experiment. Shortly after Daniel gave this talk CERN published a press release stating that there was an error in measuring the speed of the neutrinos. It appears that there were two likely sources of error: a defective crystal oscillator that provided the time stamps for the GPS signals and a faulty connection between a GPS unit and the OPERA's master clock. They will have to confirm though that this is the case with further investigations that are scheduled for May this year.